A concert with Den Danske Salmeduo (Danish Hymn Duo) is a remarkable journey through centuries of church music. 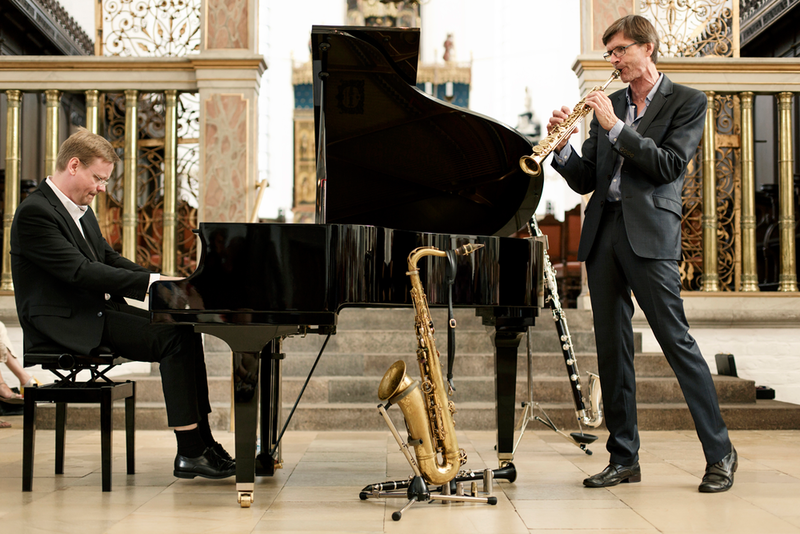 Hans Esbjerg (piano) and Christian Vuust (saxophone, clarinet) blend the simplicity of Nordic hymns and folk songs with the gentleness of the classical tradition and playful jazz improvisation. The common thread running through this concert is the beautiful and vigorous hymns that enrich the Danish music tradition – hymns that have been part of everyday life for ordinary Danes for many generations. The audience hears highlights from the duo's extensive repertoire. Esbjerg and Vuust have written a number of exciting new arrangements, respecting the musical material and the textual foundation. Den Danske Salmeduo (Danish Hymn Duo) has since 1996 played almost 500 concerts and released six critically acclaimed albums. "Salmer til folket – Luther-salmer i nyt lys (Hymns to the people – Luther hymns in a new light)" from 2016 is a combined CD and book release with new interpretations of the music of the Reformation. Christian Vuust is a lecturer at the Royal Academy of Music in Denmark and has an extensive career as a jazz saxophonist and composer. Hans Esbjerg is a conservatory-educated pianist and is organist at Christianskirken in Fredericia.